UK, 1954, 75 minutes, Colour. Merle Oberon, Richard Todd, Leo Genn. This film is based on a novel by Stefan Zweig, Austrian author, prolific writer – with many films based on his works, Letter from an Unknown woman and this film, along with three other versions, of 24 in a Woman’s Life. The film is colourful but very much dialogue-driven with serious themes. The Riviera location photography in Antibes and Monte Carlo is attractive. Leo Genn portrays a writer in Antibes, discussing with friends the possibility of love at first sight – especially after the proprietor of the hotel where the group is staying experiences his young fiancee going off with another man soon before the wedding. The guests are sceptical about love at first sight. The author tells them the story of a woman. 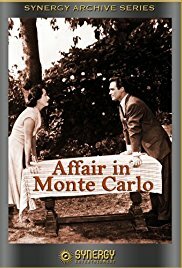 Merle Oberon portrays the woman, a widow, going to Monte Carlo with the writer, not interested in gambling but listening to him in his observations about how people gamble and play, concentrating on hands and body language. She notices a young man, Richard Todd, who loses all his money and is obviously in despair. She follows him, has a conversation with him, sees him contemplating suicide on a bridge, offers him accommodation but the hotel refuses and she gives him money to find somewhere to stay. She is obviously attracted to the young man and he to her. They go for a ride into the mountains. He tells his story, Irish background, gambling problem, teaching fellow students at school in England how to gamble, his father’s disapproval, his going to Paris and stealing his aunt’s jewellery to gamble and Monte Carlo. In the mountain, explaining I Got a Lovely Bunch of Coconuts to their driver, they see a church and going. The priest of the church has a reputation as a composer and has performed his work at the Albert Hall. The priest plays the music, invites the couple to lunch, cooked by his mother who is his housekeeper but does not speak English. The priest is hospitable and sympathetic. He assumes the couple is married but the mother does not and gives the woman a gift. The young man returns to the church and makes a vow never to gamble again. The woman thinks that she can never be with them even though she loves him. She gives him money for a rail ticket for him to go back to Paris. At the last moment, the writer encourages her in her decision to go to the station but the train is pulling out. When she returns to the casino, she finds the young man gambling the money, winning, urging her to wait, following the example of another gambler – but, ultimately, losing and rebuking the woman in bringing him bad luck. She leaves sad. The writer then introduces his wife to the group at the hotel – and she is the woman. The themes are serious and intense in performance and dialogue.